In the late 1800s, in conjunction with the American Playground Movement, the Richard and Sarah Smith Trust created Smith Memorial Playground & Playhouse. 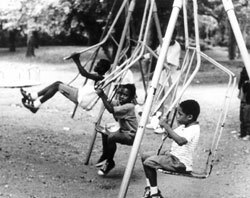 The Movement began in the mid-1890s when child-saving reformers, social workers and child psychologists, concerned about the health and welfare of urban children and believing that supervised play improved the mental, moral and physical well-being of children, urged local governments to construct playgrounds where children could play safely. Smith, one of the first examples of this thinking, opened in 1899. For more than 100 years, Smith’s operations were supported almost exclusively by the interest from the Trust. 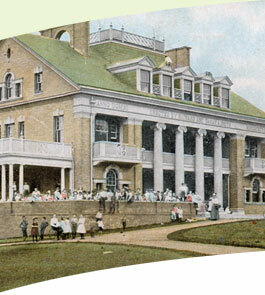 In 2003, in response to the continuing deterioration of the Playhouse and the closure of the Playground due to safety and accessibility issues, a group of concerned citizens established a non-profit organization, Smith Memorial Playground & Playhouse Inc., to fund the restoration of the site, maintain the facilities and expand services. The Trust was no longer sufficient to maintain Smith, and the board and staff work hard to raise additional funds from individuals, corporations and foundations to support the organization’s day-to-day activities and capital projects. Since 2003, Smith’s board has been successful in increasing the organization’s operating income by more than 100%. In addition, Smith has raised more than $7 million in support of its capital campaign to restore the Playhouse and Playground. With these funds, Smith has renovated the Ann Newman Giant Wooden Slide and opened the Playground with two new state-of-the-art, high-performance play areas built in compliance with all current safety measures and with accessibility for handicapped children. In 2008, Liberty Property Trust donated the materials for and constructed the Liberty Labyrinth; and in 2010 Smith restored the Playhouse roof, exterior walls, cornice, windows, terraces, and the first floor interior of the Playhouse. The Tot-Lot, designed for children under 5, opened in August 2009. Future renovation plans include further restoration of the interior of the Playhouse to expand programming space, and improvements to make the front lawn a beautiful, natural play space. 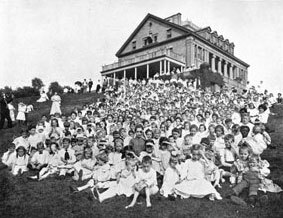 The Playhouse was designed solely as a play space for children by one of Philadelphia’s most prominent late 19th century architects, James H. Windrim. The open layout of the 16,000 square foot three story brick and masonry structure features floor to ceiling windows, porches and room upon room with a variety of play opportunities from riding tricycles to tumbling to putting on a puppet show. The Playhouse is situated on its original landscape — 6 1/2 acres of open fields, wooded terrain, and sloped hills — home to the century old Ann Newman Giant Wooden Slide, a treasured play experience for generations of Philadelphia’s children. Since its opening in 1899, Smith has had a very diverse constituency. Smith is a unique asset to the surrounding communities of Strawberry Mansion, Brewerytown and Fairmount. However, Smith’s constituency does not stop at these boundaries, with children from over 500 zip code areas in the region (including every Philadelphia zip code) visiting the Playground and Playhouse. Smith has never charged an admission fee in order to be accessible to all, but encourages families to become members to show their financial support. Smith also hosts field trips from school and camp groups, birthday parties, and offers weekly storytelling activities and monthly craft programs. 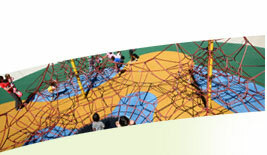 Smith invites families to events such as “Play-a-Palooza,” “Smith’s Birthday Party,” “Halloween” and other fun events.